Life In A House of Blue ! : I Want to Go to IZEA Fest 2009! Home > izeafest > I Want to Go to IZEA Fest 2009! I Want to Go to IZEA Fest 2009! 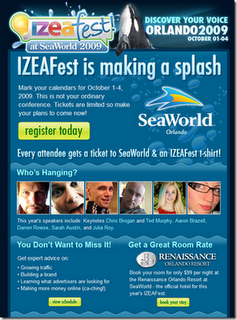 I want to be able to attend IZEA Fest 2009 being held at Sea World in Orlando, Florida! Tickets are $229 and you can win one at There's Something About Harry . If you attend you just may meet some great people like Scott Monty, Zena Weist, Joseph Jaffe, and George Smith who are some of the greats on this fall's panel at IZEAWORLD. Pat Curry of CatPurry.com has won a code for a free ticket to IzeaFest at SeaWorld this year! Another drawing will be held on July 15th (keep your fingers crossed that I WIN), and another drawing for another ticket will be held at the end of July! I'm not quite sure what that is, but good luck with winning a ticket! Good luck, Susan! We'd love to see you. I hope you win a ticket...if you don't I hope that you could go anyways.